Igor Popov graduated from Pushkin Leningrad State University named with honors in Mathematical physics (1978). Since 1978 he has been working at ITMO University (then known as LITMO): Assistant (1978 — 86), Associate Professor (1986 — 96), DSc (1996), Professor (1996 — 97), Head of the Department of Higher Mathematics (1997). For a long time now he has been training teams from ITMO University for the city and All-Russian Olympiads on mathematics. He was the Head of scientific projects on grants of the Ministry of Education of Russia, Russian Foundation for Basic Research. Scientific interests are concentrated in the field of the mathematical theory of dispersion. He has published more than 100 scientific works on the subject of mathematical physics in Russian and international journals. Article about Professor Igor Yu. 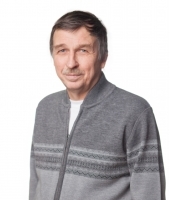 Popov in ITMO University’s newspaper after turning fifty. 1) Popov, I. Yu. Model of a quantum point as resonator with translucent border, FTG 1994, t. 36, N7, p. 1918-1920. 2) Popov, I. Yu. Theory of expansions of operators and stratified currents, UMN, 1995, t. 50, issue 4, page 117. 3) Geyler, V. A., Popov, I. Yu. Ballistic transport in nanostructures: obvious solved models, TMF, 1966, t. 107, N1, p. 12-20. 4) Popov, I. Yu. Hydrodynamic stability and perturlation of the Schrodinger operator, Lett. Math. Phys., 1995, v.35 N 2, p. 155-161. 5) Popov, I. Yu. Stokeslet and operator extention theory, Revista Matematica de la Univ. Complutense de Madrid, 1996, v. N 1, p. 235-258.